Keep us posted! Send your news to maplewoodlax1957@gmail.com. Jules has also been added to the Division I Watch List for the United States Intercollegiate Lacrosse Association (USILA) 2018 Player of the Year award. Selected 7th overall in the 2018 Major League Lacrosse (MLL) draft, Jules will join Florida Launch Lacrosse after graduation from Rutgers. 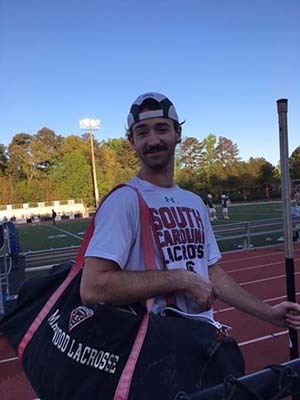 and claimed runner-up honors in the SouthEastern Lacrosse Conference (SELC) divisional championship. Maplewood Lacrosse Club was along for the ride, as Zeke still uses his MLC gear bag. is the son of Columbia High School 1979 lacrosse All-American Jay Harkey. MLC congratulates Zeke and the University of South Carolina Gamecocks for an outstanding season. face-off specialist Mack Turi was selected to represent the New Jersey Regional Team in the Command Division at the 2017 Under Armour Underclass Lacrosse Tournament in Baltimore, MD. Featuring the best high school lacrosse players in the nation, the event is part of Under Armour’s All-America Lacrosse Games. These Maplewood brothers gave their all—on the athletic field and to their country. a man, not only surviving the rigors of military academy life but embracing it fully as he was groomed into an officer of the U.S. Navy. On July 16, 2003, Kevin Bianchi followed in his brother Bobby’s footsteps again—this time tragically Kevin and three other crewmen died when the Sea Dragon cargo helicopter he was co-piloting crashed during a training mission 10 miles from the Naval Air Station Sigonella in eastern Sicily. Navy Cmdr. Kevin Bianchi was 40 years old, married and the father of two sons, aged 9 and 7, and a 3-year-old daughter. He was also survived by his parents, Albert and Sue Bianchi of Maplewood, and his brothers James and Richard. "These guys were just standout human beings. I think about that family, and that’s the way they all were," remembers former Columbia High School athletic director and lacrosse coach Bob Curcio, who has been close with the Bianchis for years. "Sure they were all very good athletes, but more importantly, probably four of the nicest people you would ever want to meet," he says of the Bianchi brothers he coached and taught. "Kevin, for one, just loved life so much. He was the kind of guy who always had something good to say about everybody. Now, I’m sure they got into their fair share of trouble in high school that Coach Curcio never found out about," he says with a playful grin, "but they were really a special group of guys." "Kevin would occasionally just show up in my office every now and then over the years just to say hello when he was in town, usually soaked in sweat from a run of unthinkable distance he had just completed,"
of Kevin and the kids in the tub with Santa hats on," Curcio remembers, and then looks away, lost in a memory. door. You wanted your kids to grow up and be like them." Athletics is indeed one area where the Bianchi brothers made a name for themselves. Jimmy and Bobby were high school All-American lacrosse players. Two years ago the Star-Ledger voted Bobby Bianchi the high school lacrosse player of the century. Kevin was "an exceptional wrestler for us," Curcio states proudly. And Richard, the youngest Bianchi brother, was a standout football and lacrosse player and wrestler as well. He went on to Rutgers University. Ed Peery was Kevin’s wrestling coach at the Naval Academy. "Kevin was stocky and strong as an ox," says Peery. "We called him 'the block' because of his build. He was not highly recruited but worked his way up. "He was very entertaining and could always find a bright side and create some humor in tense situations. Peery remembers a special moment after Kevin had graduated that really made an impression on him. "This sums up Kevin Branchi in a nutshell: When my daughter passed away (in 1990), Kevin made an effort to come and see me," Peery says softly, "He came and paid his respects, and not many guys would do that. I will never forget that. He was a special person." Richie Meade was the assistant lacrosse coach at the Academy when Jimmy, Bobby and Kevin came through. "Those boys were as advertised," says Meade. "Everything you heard about them was absolutely true." He remembers Kevin as "a tough guy, but always smiling—the kind of guy you wanted to be around. He also always made you feel important." A fact that impresses Meade to this day is that all three of the Bianchi who went to Annapolis were team captains—Jimmy and Bobby for lacrosse and Kevin for wrestling. "is truly something special. It says a lot about their family." In 1987 the Academy created the Robert Bianchi award, which is given our yearly to Navy’s most valuable lacrosse player. also attended the Naval Academy and is now an FBI agent. He remembers the Bianchi brothers' prowess on the sports fields. "Those guys were all top-notch athletes—they really had something special," he says. Life at the Naval Academy, Ringel points out, is "grueling. Life at the academy is a 24-hour job, and for guys who play a major sport it’s that much more work. Everybody has to keep their academics up—no question about it. No television or radios for the first two years, a lot of studying and a very regimented life right from day one." "In the summer you had a few weeks off and then you were sent to training either on a ship or a base. To get into flight school, you had to be at the top of your class. Only the guys with the best grades and rank became pilots," Ringer says, "Being a career military man is a tough life. You are gone on deployments a minimum of six months out of the year. It’s hard, especially if you are married and have kids." he says firmly, "and the helicopters they were flying get used a lot and are always pushed to the extreme limits. When you are in that business, losing guys in accidents is a part of life that you have to deal with. It’s never easy but it becomes ingrained that it can happen at any time to anyone." most people don’t realize that when you fly a training mission it’s really set up like a combat situation. It has to be that way so you are always ready if you are called into action. Training can be as dangerous as combat; you fly low, you fly in extreme conditions, you fly fast. You see how far you can push it, you are simulating a potential real situation," Ringel says, "and knowing Kevin and Bobby, I’m sure they always gave it their all." of the servicemen that were in attendance. It was almost heartwarming. The fact that this happened twice to the same family is just horrific, but you have to realize that even though Kevin died, and Bobby too, they were doing something that they truly loved." He pauses, takes a deep breath and then says with quiet pride, "and most importantly, they were serving their country. What more can you ask for?" Raymond Leone is a freelance writer and resident of Maplewood.